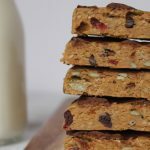 I had been experimenting for a while trying to create a homemade protein bars that tasted delicious, didn’t require any baking, was easy to make, and didn’t crumble. It was no easy feat, let me tell you. Luckily I have four very active, constantly hungry children whom I can feed my creations to without too much complaint. Crumbly or not, all my creations got eaten! The good news is that I finally found a combination of healthy ingredients that tasted great and worked exactly the way I had imagined. My kids gave me multiple thumbs up. 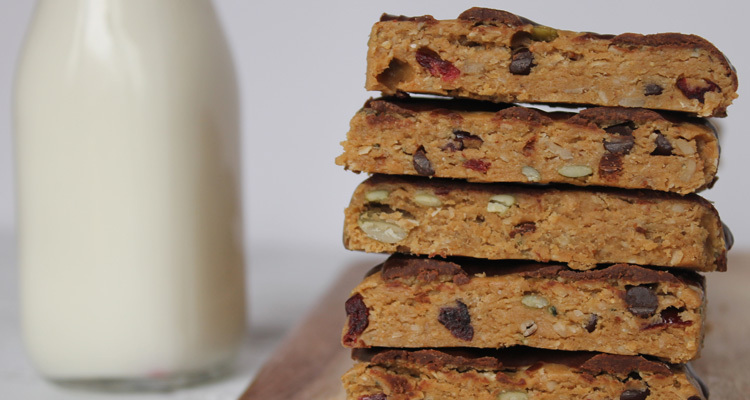 Before you dive in, I want to point out that it’s really important to use a great tasting protein powder, as it can really affect the end result of the bars. I personally used Genuine Health’s fermented vegan proteins+ powder, which is the best tasting vegan protein powder I have ever tried. It doesn’t taste powdery or chalky like some others do, and because it’s fermented I don’t get bloated or gassy either, which is equally important. One final note. If you or your kids don’t like peanut butter or cranberries or any other of the add-ins I have used, feel free to substitute them for any other nuts and seeds and dried fruits of your choice. This might be worth trying, especially is you want to send them to school, where peanut-free and nut-free policies are in place. I might experiment with a nut-free version myself, specifically of the chocolate variety! Now, if you come up with a new flavour combination that is just rocking, make sure to comment below because we would love to try it too! In a large bowl, mix together honey, peanut butter, protein powder, and almond milk until smooth. Mix in remaining ingredients with your hands and form into a ball. Roll out with a rolling pin to about ½ inch thick and use the side of a knife to form the edges of the dough into a square. Set aside. Melt coconut oil and chocolate chips in a small pot over low-medium heat, stirring constantly so chocolate doesn’t burn. Once melted, add in maple syrup, almond milk and sea salt and mix until well blended. Remove from heat and drizzle desired amount of chocolate sauce over the protein bar. Place in the fridge to chill before cutting into bars. Reserve remaining chocolate sauce for another dessert.